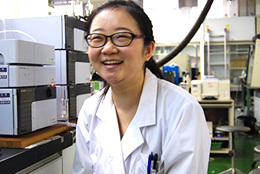 Why did you decide to study at the College of Science and Technology, Nihon University? What is your future goal? When I was still a technical college student in Japan, my friend, a senior student who was in the Department of Electronics and Computer Science (currently renamed as Electronic Engineering) in the College of Science and Technology, Nihon University, shared his experiences with me about the university. He told me that the atmosphere at the university was very good for both studying and research. So to have a clear image of what my friend said, I decided to attend the Open Campus held at the university. It was a good experience because the teachers and students were not only supportive but also genuinely interested in helping me build my academic career. After attending the Open Campus, I decided to join the College of Science and Technology, Nihon University. My goal is to be able to use the knowledge I acquire at school, to apply it in the future in order to advance the technology and improve human life. How is your student life? Personally, I’m enjoying every single moment of my student life. First of all the people around me are open and approachable for anything such as discussions or any activities in and out of school. I am assigned to Prof. Nakagawa's research laboratory, which is actually a great opportunity to learn more about both my research and field of study. And from now on, I’m looking forward to expand my knowledge in various fields of study as well as society. How do you feel about your life in Japan? I came to Japan four years ago and I can honestly say that my life has changed for the better. 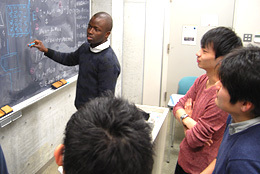 I did encounter a few challenges when I came here, such as learning Japanese and adapting to the new environment. I must say that there is a huge difference between Japanese and Ugandan culture, but nevertheless I’m used to this new life. What is your message to students who would like to study at the College of Science and Technology, Nihon University? I think the College of Science and Technology, Nihon University is a favorable place for a student who wants to enjoy life while studying. This is due to the friendly teaching and non-teaching staff who are willing to help students in need, not only academically but also other support. Also the fellow students are very hospitable and polite making it easier for one to fit in. 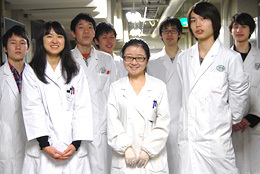 Why did you decide to study at the College of Science and Technology, Nihon University? The reasons that I wanted to study at the College of Science and Technology, Nihon University are as follows. First of all, I can choose my favorite subjects there. Second, the learning atmosphere there is good because there are a lot of schools surrounding the College of Science and Technology, Nihon University. Last but not least, I hope my learning experience here can be applied to my future. I have been here for about 7 years, and during my research life in Japan, I realized that I prefer gaining more experience by working in Japan. What`s more, I want to be one of the people who can make a contribution to society to improve the quality of human life and our environment. I would like to work at a global setting and worldwide visions. 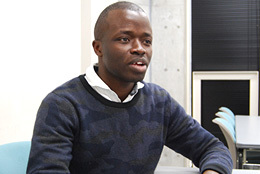 During my experience of working with many researchers from different backgrounds, I would like to exchange diverse ideas in a team to build a better society. In weekdays I go to school in the morning. I take classes do my experiments as well as discussing with teachers and seniors about that week's experiment. On holidays I often hang out around Tokyo with friends and also do part-time jobs. My friends and I usually hang out in Tokyo. We enjoy shopping in places like Shibuya and Shinjuku. Sometimes I also visit Kanagawa or Saitama with friends. I have a job at convenience store, and I enjoy working there because I learn about society, I became friends with everybody of the staff because most of the people working there are university students. Since I try to spend my holidays as busy and pleasant as possible, I am very satisfied with my student life. I think life in Japan is easy. Firstly, people are friendly. Secondly, there are many convenience stores and 100 yen shops which make it very easy to go shopping. In addition, transportation is very convenient, but transportation fees are a little bit high. For those international students who would like to study in Japan, I strongly recommend them to consult with the College of Science and Technology, Nihon University. I believe you can find a suitable Department in this college. Please try your best, do not give up challenging yourself. I hope everyone will succeed in contributing their ability to our future society.